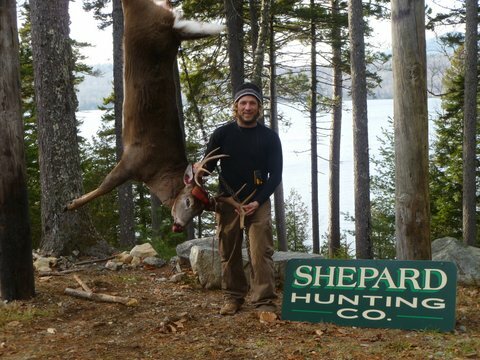 Maine has a long standing deer hunting heritage. For hundreds of years sportsmen have traveled to the North woods in search of a large antlered, heavy bodied whitetail buck. Huge tracts of timber company land and the vast stretches of unbroken forest and wilderness provide opportunity for hunting whitetails in an area that has the least amount of hunter pressure anywhere in the East. As a result of several factors, deer hunting in Northern Maine has never been more challenging. Severe winters, combined with increased predation, have dropped deer densities in many areas to as low as 1.5 deer per square mile. Hunting whitetails under these conditions will test even the very best hunters, but the challenge and possibility of harvesting the largest deer of their life keeps sportsmen coming back year after year. Every season, whitetails weighing in at close to 300 lbs. field dressed, sporting huge racks, fall to successful hunters in this region. 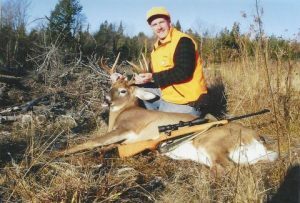 Due to its diversified terrain and habitat, Northern Maine has something to offer all types of deer hunters, whether stand hunting, still hunting or tracking in the snow. We offer both fully guided and semi-guided deer hunting packages during the entire November season, including the week long muzzleloader hunt following Thanksgiving. All deer hunting packages include three home cooked meals per day, six days of hunting and seven days/nights of lodging. We will customize all fully guided hunts to the specific wants and needs of individual hunters. If you would like to test your skills against monster whitetails, in perhaps the most demanding of all whitetail deer habitat, choose Shepard Hunting Company to help fulfill this experience.